After a resume and sample submission and after a design approval presentation I was chosen as the artist for the seventh painting in the Murals on Broadway series. The Carondelet Community Betterment Federation has a goal of 9-10 public murals in the South Broadway neighborhood. 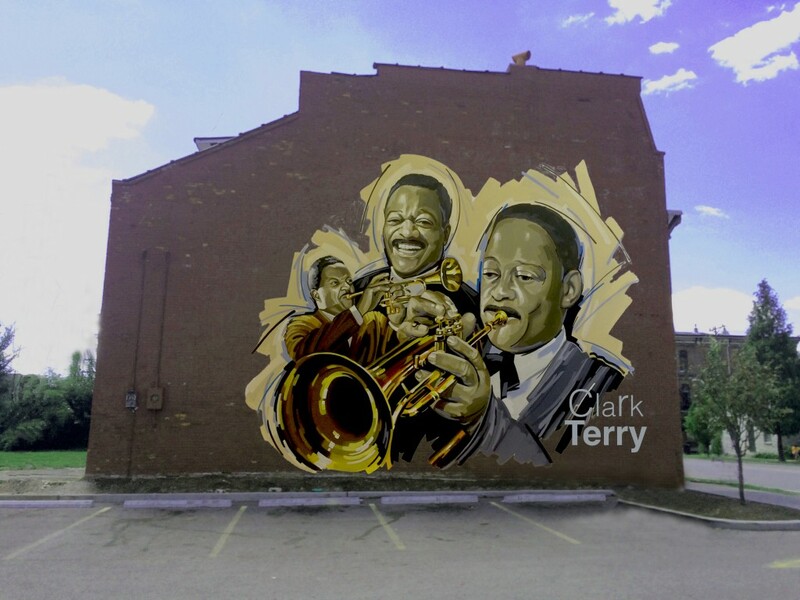 This large wall mural is a montage tribute to Jazz trumpeter Clark Terry. Mr.Terry passed away this past February at the age of 94. Having been born and reared in the Carondelet neighborhood, his musical talent would eventually take him around the world. He played with Count Basie, Duke Ellington and was mentor to Miles Davis. He has sold more jazz records than any other musician! The painting is about 24′ x 30′ in size. I estimate the completion time should take ten days. In conclusion, the Federation will plan a dedication ceremony to officially unveil the art to the community.